Could This Be a Stocks and Shares Buying Opportunity? This morning has led to Prime Minister Theresa May giving the ‘sales’ pitch of her career on the Brexit deal after several ministers resigned. And as the GBP crashes on the back of the turmoil, eagle-eyed investors are spotting opportunities all over the UK equity market. 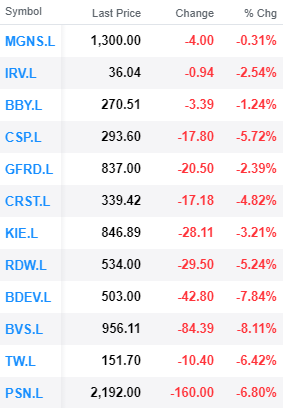 Some of the leading firms in this sector are being heavily hit with the likes of Bovis, Persimmon, Barratt and Taylor Wimpey all down over 6%. 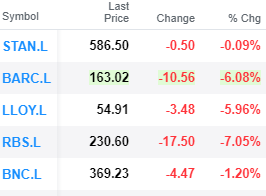 Leading banks with heavy exposure to the pound are suffering this morning with RBS, Lloyds and Barclays getting hit hardest. British airlines (+ Ryanair) are also struggling and embattled firm Flybe has dropped through the 10.00 mark losing nearly 15%. As a result it’s a very volatile day on the market for investors. As always, please feel free to call one of our brokers directly on 0121 454 0770 to get the latest market analysis.